How about making a New Year’s resolution before the New Year? Resolve to maintain your weight during the holiday season, since the average American gains five to ten pounds between Thanksgiving and New Year’s. But how can you maintain your weight surrounded by your favorite high-calorie goodies and holiday drinks? Read on for some tips on how not to become a statistic. Don’t try to diet. Your goal should be to maintain your current weight, not reduce it. Plan and assemble several quick, healthy meals and have them readily available for reheating to avoid relying on high-fat fast food when your days become chaotic. Instead of cutting out high-calorie favorite holiday dishes, take a small portion of each and load up on healthier options like vegetables, fruits and breads. Don’t attend a cocktail party on an empty stomach. The effects of alcohol are felt much more quickly and can lead to overeating and over drinking. If you do drink alcohol, try to drink one glass of water before each glass of an alcoholic beverage. Center activity around non-food events such as ice skating, tubing, skiing, renting a holiday movie, serving in your local homeless shelter, or singing carols. Offer to bring a favorite low-calorie dish to holiday parties, so you know there will be at least one "safe" item available. Arrive fashionably late and stand far away from buffets so you're not tempted to nibble constantly. Continue your regular exercise program right through the holidays. It's the key to maintaining good health and alleviating holiday stress. Stick to appetizers that help you meet the recommended food pyramid guideline of five or more servings of vegetables and fruits a day, such as crudités and antipasto. Choose the high-fiber selections on the buffet. Besides fruit and vegetables, choose hors d'oeuvres that contain whole grains and/or legumes. Limit high fat choices, such as fried chicken wings, miniature sausages, and most cheeses. To satiate your palate, contrast flavors and textures—crunchy, smooth, hot, cold, spicy. Try the following instead of the usual high-calorie holiday drinks at a cocktail party: Seltzer mixed with fruit juices; sparkling apple juice or apple cider; hot apple cider; flavored, calorie-free water; or low sodium vegetable juice. 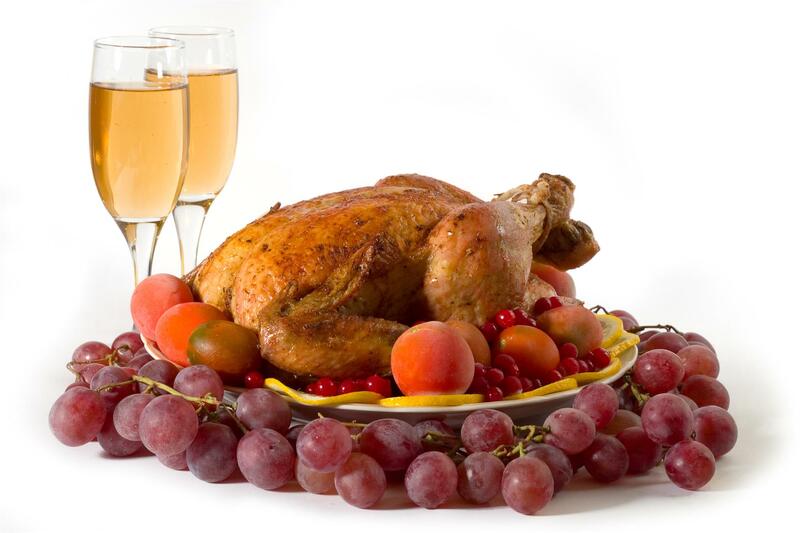 Bake dressing in a covered casserole instead of stuffing it in the turkey, as it absorbs much of the bird’s fat. Limit the amount of butter or margarine you use to sauté your vegetables. Use chicken or turkey broth for additional moisture. Use a rack in roasting pan so the fat drips off. Use a fat separator for the roasting pan juices and skim off all fat before making the gravy. Make pies with canned evaporated skim milk. Halve the amount of sugar in your recipes, using brown sugar instead of white. You’ll never know the difference. Use a larger amount of spices than the recipe suggests. Use packaged light or fat-free whipped topping.l If more than one choice of pie is offered after the meal, choose one, not a bit of each. Choose your favorite so you will be satisfied. Eat the filling of the pie and just a bit or none of the high-fat crust. Eliminate butter when mashing potatoes. Use chicken broth and canned evaporated skim milk instead. Sprinkle hot vegetables with dill for flavor instead of butter. Use low-fat canned cream soup in the traditional green bean casserole. Don't skip meals before the big meal that day. You'll be too hungry and may overeat. Treat it as a regular day. Begin the meal with a low-fat soup or salad. You'll eat less during dinner. I know... all GOOD on paper... but in practice...hard to follow!